I was in a painting class last year and the instructor asked me if I wanted to see a really awesome product. Of course I said sure…paint geek that I am 🙂 It was like liquid metal paint. 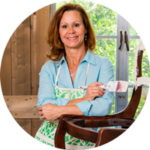 You could paint an item to look like metal, pretty much anything… and then age it with a luscious oxidized patina only time could have orchestrated. Except time wasn’t a factor. I could control the entire process including how much and where I wanted the patina to show! I’ve patiently waited for just the right project to apply an aged patina to. 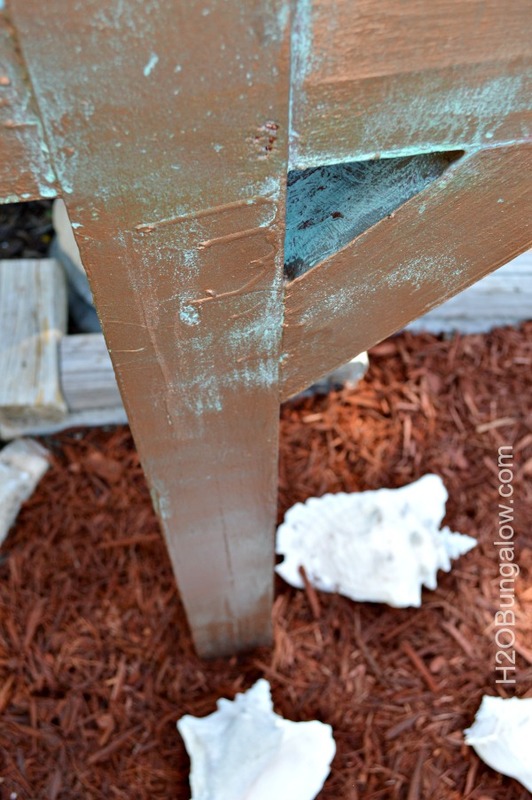 Today I’m sharing how to use Modern Masters Metal Effects on my coastal mailbox makeover. Our mailbox was the first DIY project I tackled when we moved in to our little project house two years ago. Our harsh FL sun has not been kind to my flowered mailbox. It was faded and getting rusty but still in great shape mechanically. 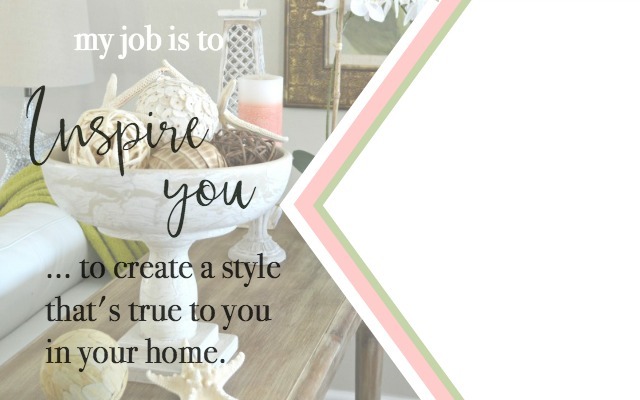 A creative makeover is all that was needed to up the style ante. I was more than happy to tackle the task. 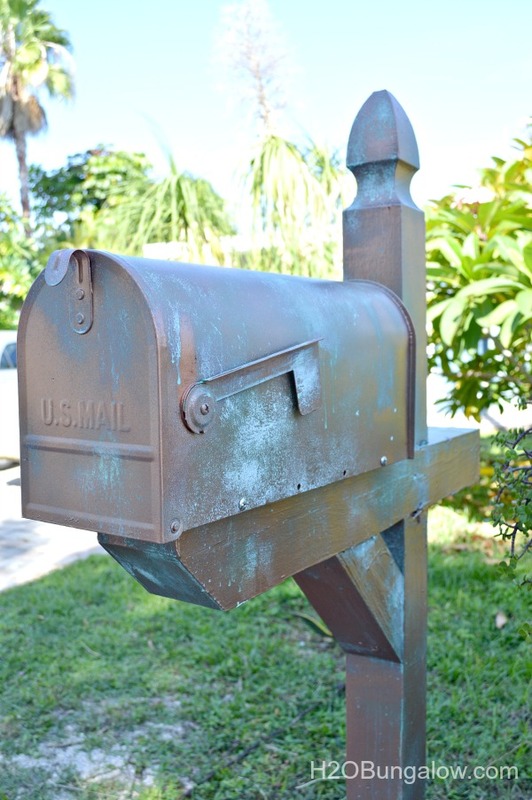 I used the Metal Effects Primer, Copper Reactive Metallic Paint and the Green Patina Aging Solution from the Modern Masters Metal Effects product line to make my coastal copper mailbox. It’s a lot less expensive to just purchase the Metal Effects kit. Let me share with you how to use Modern Masters Metal Effects in a few simple steps. 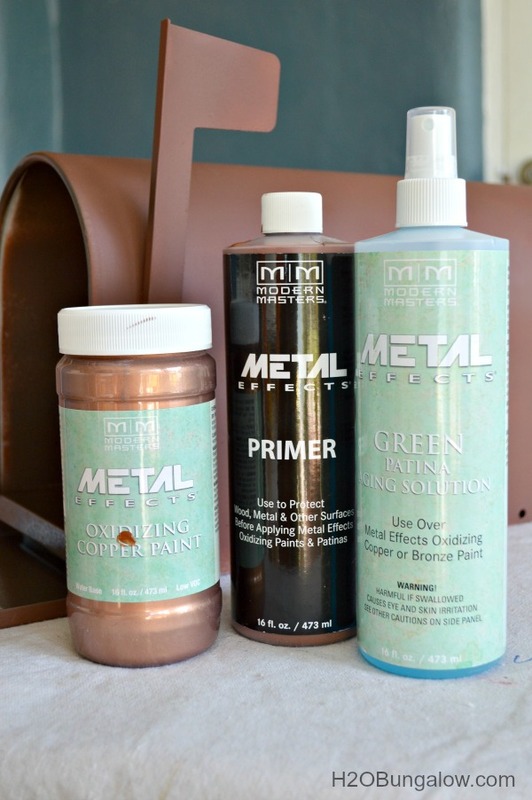 If your coating metal, Modern Masters recommends using a primer for metal before you apply the Metal Effects Primer. After that dried I used two coats of Metal Effects Primer and waited 12 hours. 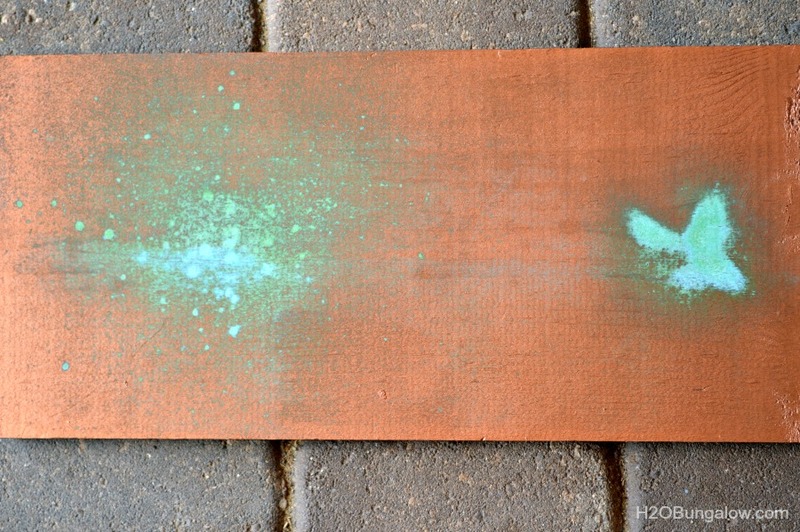 Next, you’ll use two coats of the Copper Reactive Metallic Paint. Put the first on and give it about 30 minutes to dry. This is my mailbox with the first coast of the copper paint. I’m loving the look already and can’t wait to see how it looks with my coastal faux painted copper front door I made a few months ago. 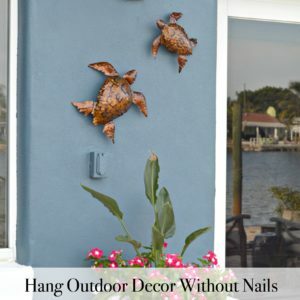 Immediately after painting your second coat of Copper Reactive Metallic Paint, spray the Green Patina Aging Solution onto your project. I choose the green patina but there is also a Blue Aging Solution available. Because the amount of aging solution spray you use affects how your patina will look I made a sample board. That way I had an idea of how much spray to use to create the look I wanted on my mailbox and post. The pattern on the left is about 4 sprays at approx 12 inches away. The pattern on the right is about 3 sprays 4 inches away. Once you’ve sprayed the aging solution onto your project, it takes several minutes for the effect to fully show. Here’s a quick video on how to use Modern Masters Metal Effects. I found it helpful. 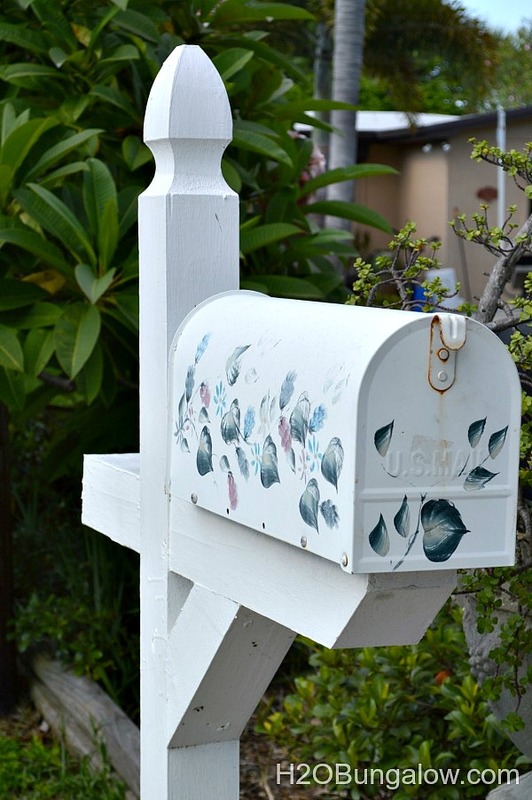 I opted for a weathered look on the top of my mailbox and post. I sprayed the aging solution heavily in the nooks of the post and lighter and further away on the edges of the post itself. This is exactly the look I wanted. 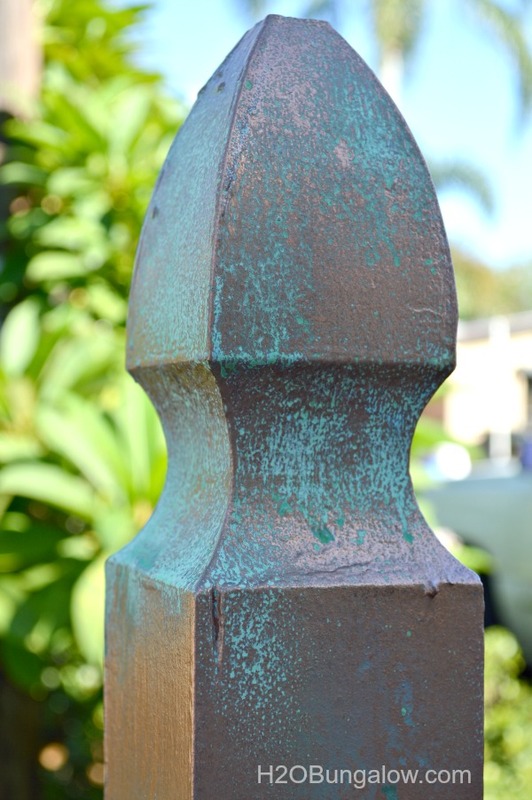 I had a beautiful aged copper patina that looked like it’s taken years to achieve. Copper items are pricey, especially a big item like a mailbox. I saved a bundle by giving my current mailbox a makeover! Now that I’ve shared the simple steps of how to use Modern Masters Metal Effects are you ready to try a project? 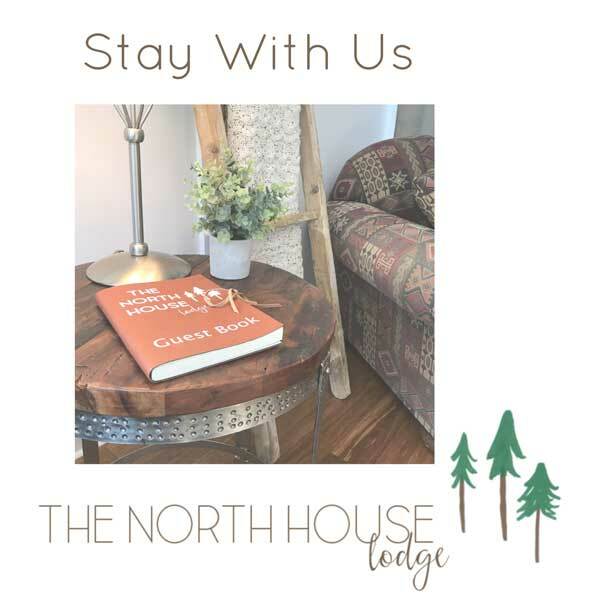 As you might have guessed this is a sponsored post, I was provided product and or compensated for sharing this information. 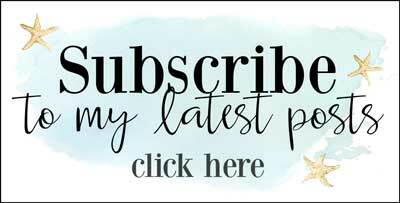 All opinions, craftiness and projects are 100% my own and I ‘ll only share items I think have value for my readers! This is so great! Way to make a mundane thing look so interesting! Pinning and placed on my to do list! So Glad you liked my copper mailbox. 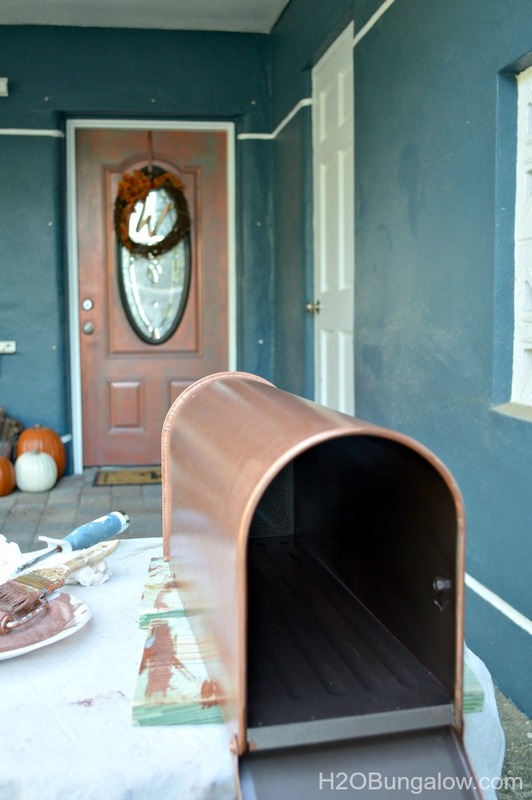 I have a weakness for copper and my mailbox was a fun way to add some flair and be different in our little neighborhood. 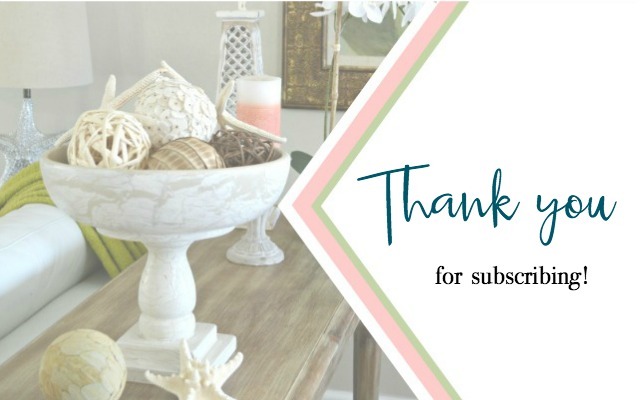 Thanks so much for your visit and comment! Thanks and you CAN do so many things with it! 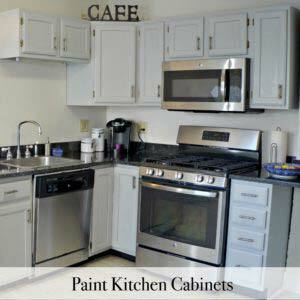 Your right, endless potential for decorating and creating with this patina. They make a blue too which I can’t wait to get my ands on as well! Thanks for stopping buy! Love love love the Modern Masters Metal Effects Kits, especially the aged copper one. 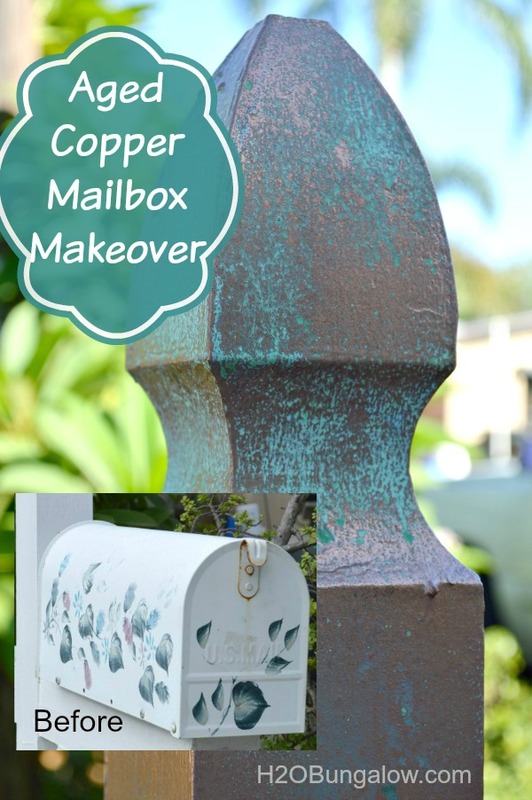 Your mailbox looks fabulous Wendi – just love the new look and I bet it looks perfect with your aged copper door in the background. Your mailbox looks beautifully aged! 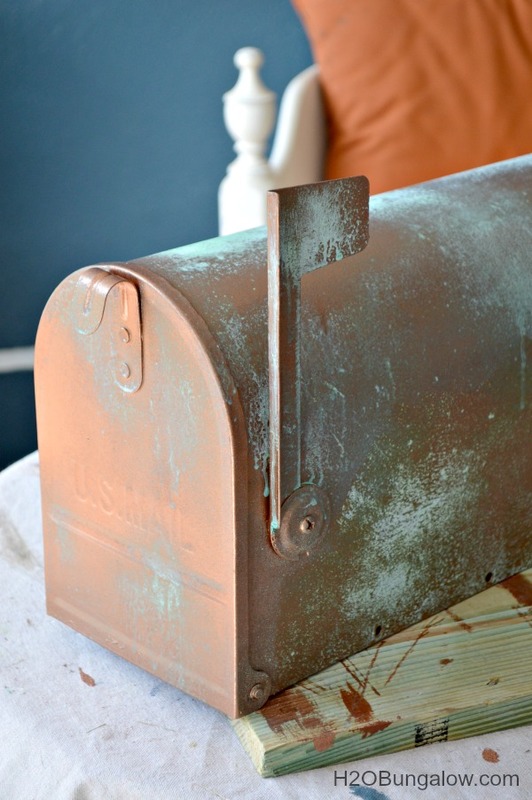 Love the copper patina look, and you’ve got me thinking about where I could use this! Pinning!